I love carrying on traditions with my own children that I loved as a child. Every summer I remember our mom taking us berry picking to the local berry farm. It was typically warm, a lot of work, but always so much fun! We would reap the benefits in the winter when we would spread some homemade strawberry jam on a piece of bread, freshly baked from the oven, or sliced on top of waffles after church. Strawberries are probably my favourite berry and a few days ago we had a glorious morning picking with our children. We took our children to a local berry farm, Driediger Farms. This farm was stunning! Rows and rows of all different types of berries made for a beautiful backdrop on a sunny morning. 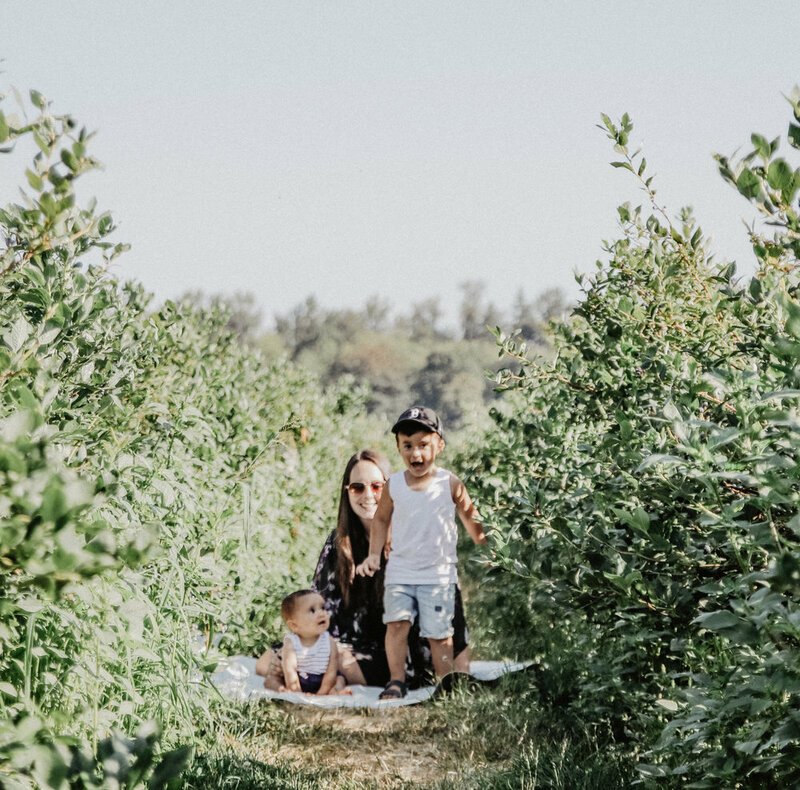 Our kiddos were so excited to pick and it was an honour for them to hold the berry buckets. We quickly jumped over to the strawberry field across the street and picked in the early morning. I'm not gonna lie, it was hot. I think it was 32 degrees later that afternoon, but our kids did wonderful. They picked for a solid ummm... 20 minutes....and then they were done. 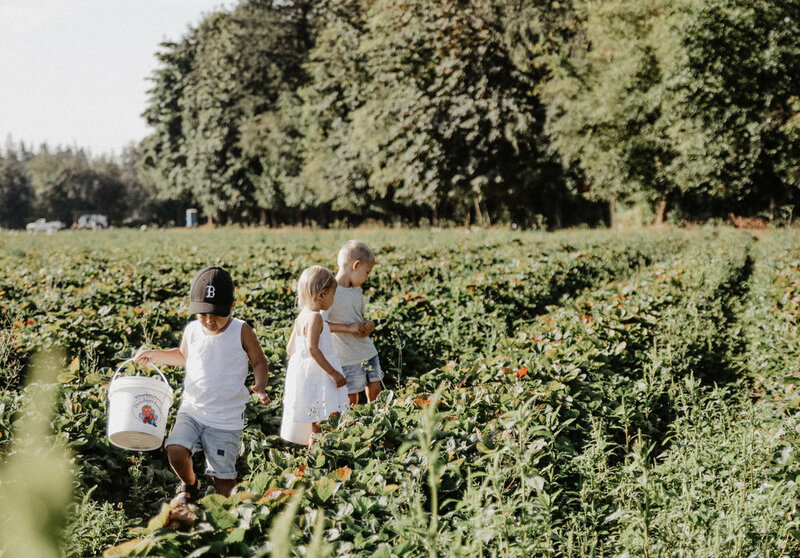 However, in that short amount of time we filled our buckets very quickly because there were so many red, ripe strawberries (anyone remember the book The Little Mouse, The Red Ripe Strawberry, and the Big Hungry Bear?!? - totally reminds me of it from childhood!) I may have tested one or two strawberries and they were unbelievable! When we got home, our kids were begging us for some strawberries and they tasted like candy. So sweet, so juicy - incomparable to strawberries you find anywhere else. Driediger Farms grows many delicious types of berries such as strawberries, blueberries, raspberries etc., and after picking a few different types, we headed to the family area. There is a cute little shaded picnic area and a huge jumping pillow with a playground as well. Our children loved playing together and could have jumped for hours! It was the perfect end to a wonderful morning. If you are local to the Fraser Valley, you must check out the berries at Driediger Farms. We tried the U-pick fields, but they also sell flats of freshly picked (that morning!!) berries that you can pick up and take home. 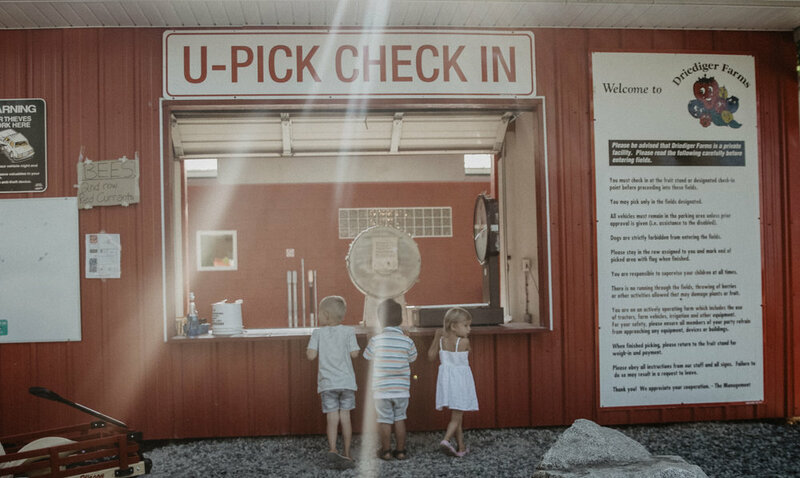 Your kids will love the children's area and the staff are very friendly and helpful. I love that when you purchase a bucket for berry picking at Driediger Farms, they even give you a lid for your drive home! We did some serious preserving, slicing and baking with our red gems when we got home, but feel free to send us your best strawberry recipes. I see some homemade waffles in my future! Happy Picking!